The Free Fall promotion is back and has great offers just for you! When you reserve your minimum three-night vacation to any Dreams Resort & Spa, you will enjoy every third night of your stay for free! Plus, up to two kids stay free, and you will be treated to up to $400 in resort coupons to use on things such as spa treatments, romantic dinners, bottles of wine and more! For more information, head over to the Special Offers page on the Dreams website. 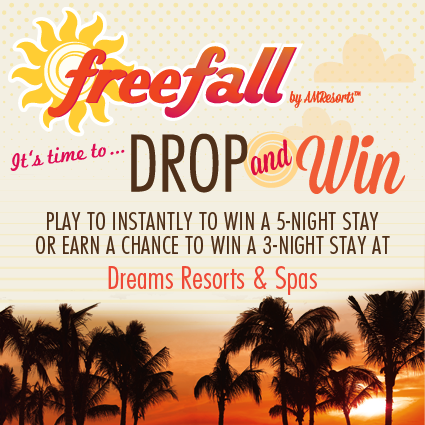 Plus, play our Drop & Win game on any Dreams Facebook page where you will be entered to win a three-night stay or you may possibly be the lucky, instant winner of a five-night stay! This entry was posted in Dreams Cancun, Dreams La Romana, Dreams Los Cabos, Dreams Puerto Aventuras, Dreams Puerto Vallarta, Dreams Punta Cana, Dreams Resorts & Spas, Dreams Riviera Cancun, Dreams Tulum, Dreams Villamagna, Uncategorized and tagged Dreams Cancun, Dreams Huatulco, Dreams Los Cabos, Dreams Palm Beach, Dreams Puerto Aventuras, Dreams Puerto Vallarta, Dreams Punta Cana, Dreams Resorts & Spas, Dreams Riviera Cancun, Dreams Tulum, Dreams Villamagna, Free Fall, Free Fall Promotion. Bookmark the permalink.